Rudy Gay scored 18 points off the bench, and Manu Ginobili added 17 as the San Antonio Spurs bumbled and stumbled through the first 3 1/2 quarters but found a way to defeat the visiting Sacramento Kings 98-85 on Monday and clinch a 21st consecutive playoff berth. 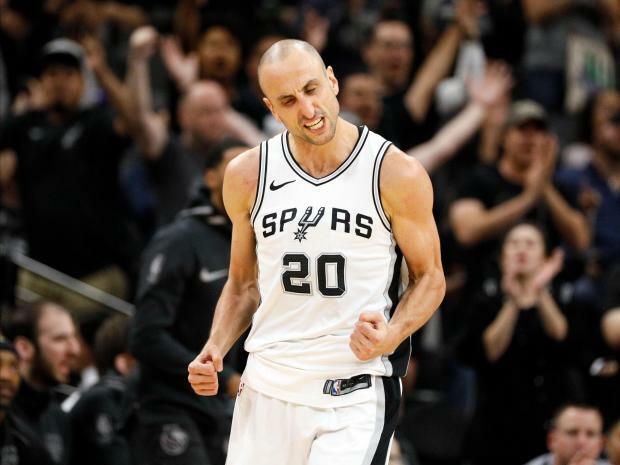 The win allowed the Spurs to continue the league's longest active postseason streak and tie the Portland Trail Blazers (1983-2003) for the second-longest streak in NBA history. The Syracuse Nationals/Philadelphia 76ers hold the record at 22 seasons from 1950-71. No other NBA team has an active streak longer than six seasons. LaMarcus Aldridge added 15 points and 14 rebounds for San Antonio, while Patty Mills hit for 15 points and Bryn Forbes scored 11 for the Spurs. Willie Cauley-Stein led all scorers with 25 points and pulled down 10 rebounds for the Kings. Russell Westbrook recorded his NBA-leading 25th triple-double to help Oklahoma City clinch a playoff berth with a win at Miami. Westbrook scored 23 points, grabbed a season-high 18 rebounds and dished off 13 assists. Paul George had a game-high 27 points, and Jerami Grant added 17. Josh Richardson led Miami with 18 points, and Hassan Whiteside added 16 with eight rebounds. Anthony Davis scored 28 points, and New Orleans clinched a playoff berth with a victory at Los Angeles. The Pelicans won their fourth consecutive game as they completed a sweep of a three-game road trip to reach the playoffs for the first time in three years. New Orleans' Nikola Mirotic had 24 points and a career-high 16 rebounds, E'Twaun Moore scored 19 and Ian Clark returned from a two-game absence caused to a sprained ankle to score 13 off the bench. Sindarius Thornwell scored 20 points to lead the Clippers. Nikola Jokic had his second triple-double in as many games, and Denver used a fourth-quarter comeback to beat visiting Portland, keeping the Nuggets' playoff hopes alive. The Nuggets, who trailed by 11 points early in the third quarter, outscored the Trail Blazers 22-13 in the fourth quarter. Denver, which won its sixth straight game, and Minnesota are both 46-35 and tied for eighth place in the Western Conference standings. The winner of the Nuggets' Wednesday night regular-season finale in Minneapolis will go to the playoffs. Jokic recorded 15 points, 20 rebounds and 11 assists for the Nuggets. Will Barton scored 22 points to lead Denver. Damian Lillard scored 25 points and Jusuf Nurkic had 20 points and 19 rebounds for the Blazers, who lost their fourth consecutive game. Portland would wrap up third place in the West with a win over fourth-place Utah on Wednesday. Karl-Anthony Towns had 24 points and 18 rebounds as Minnesota defeated Memphis in Minneapolis. Towns hit 11 of his 14 shots in the win, helping the Timberwolves shoot 48.3 percent for the game. Jeff Teague matched Towns' scoring total and added a game-high eight assists for the Timberwolves, who had lost two of their previous three games. Ben McLemore led five Grizzlies in double figures with 18 points. Shabazz Muhammad came off the bench to score 22 points, leading Milwaukee to a win over visiting Orlando in the final regular-season contest at the Bradley Center, where the Bucks have played since 1988. With the victory, Milwaukee moved in front of the Miami Heat into sixth place in the Eastern Conference with one game remaining. Milwaukee owns the tiebreaker with the eighth-placed Washington Wizards after winning the season series. The Heat own the tiebreaker over the Bucks. Nikola Vucevic had 17 points and 10 rebounds for the Magic, who have lost three in a row. Kevin Love had 28 points and LeBron James added 26 points, 11 assists and six rebounds to lead Cleveland to a win at New York. JR Smith and Jordan Clarkson each added 16 points and Larry Nance Jr. had 10 points off the bench for the Cavaliers. Love sank six 3-pointers and both Smith and Clarkson had four apiece for Cleveland, which moved within a half-game of the idle Philadelphia 76ers for third place in the Eastern Conference. Michael Beasley had 20 points to lead the Knicks, who lost for the sixth time in seven games. Jonas Valanciunas had 25 points and nine rebounds in three quarters, and Toronto erased an early 17-point deficit while rolling past host Detroit. DeMar DeRozan had 16 points and seven assists, and Jakob Poeltl added 12 points off the Raptors' bench. The Pistons were missing Andre Drummond (Achilles tendon), Blake Griffin (ankle) injury and Reggie Bullock (knee). Rookie Luke Kennard led Detroit with 20 points. Allen Crabbe celebrated his 26th birthday by scoring a career-high 41 points as host Brooklyn beat Chicago. Crabbe helped the Nets win three straight for the first time this season by hitting 12 of 15 field goals and 8 of 11 3-point attempts. D'Angelo Russell added 21 points and 11 assists while Spencer Dinwiddie contributed 20 for Brooklyn, which swept the season series for the first time since 2004-05. Sean Kilpatrick, who began the season with Brooklyn, led the Bulls with 16 points.